This weekend begins the last month of what has been a glorious year in local music. Like the previous years before it that have built up to now, fans will be rushing to catch every show they can amidst the holiday season and bands will be pushing like crazy to leave lasting impressions with a lineup of amazing gigs and album release shows scattered liberally throughout the month from beginning to end. So while we say farewell to November and hello to December, we have a handful of brilliant, important shows to choose from, each packed with their own power and glory. There really seem to be two shows to choose from Friday night, equally brilliant and compelling that demand your attention. That’s just my opinion, but I believe people will be torn between the two based on the strength of the lineups alone. 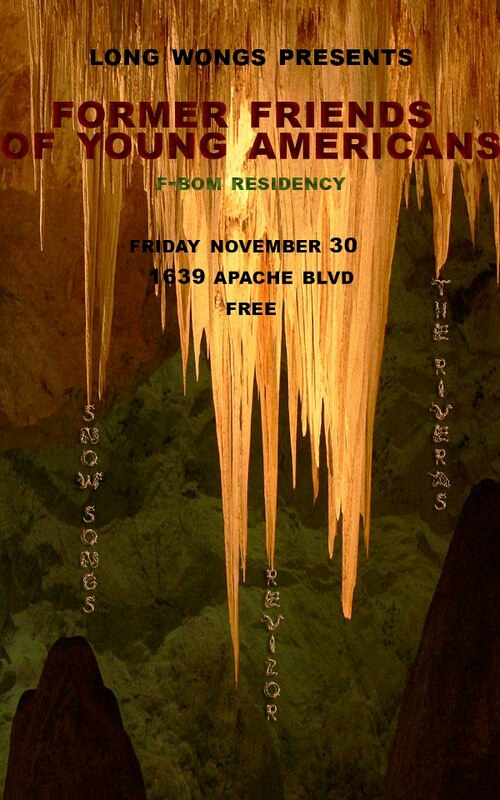 This is the final FBOM Residency night for Former Friends of Young Americans, your favorite shoegazing apocalypse that seems to only get better and better with each show, no matter what venue you may find them in. This weeks finale will welcome to the hosted stage the likes of Snow Songs, Revizor, The Riveras and Steff Koeppen and the Articles. This will be an amazing show where this legendary Tempe proving ground welcomes bands from all points of Arizona to dazzle listeners and lookers on alike. There are certain shows that seem designed to cram as many bands I adore into one evening as possible and this may be one of them. This also happens to be a very special show marking the release of Gospel Claws new album Put Your Sunshine Away–an album made possible by their very fans after a successful Kickstarter campaign. 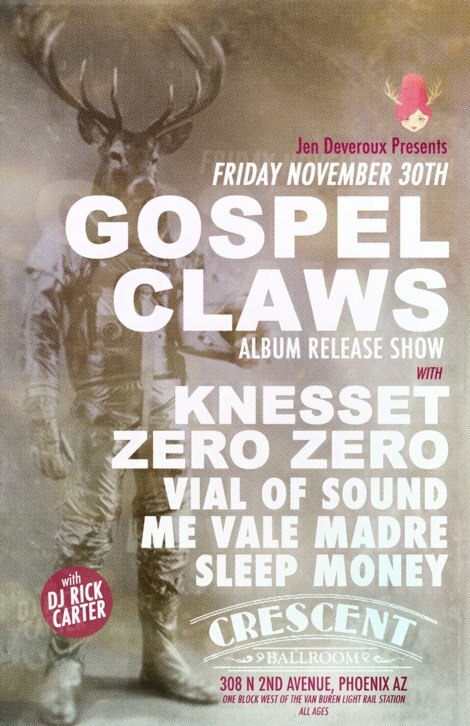 This very special evening brought to you by local luminary Jen Deveroux will feature, not only Gospel Claws blowing your mind, but the likes of KNESSET, Zero Zero, Vial Of Sound, Me Vale Madre and Sleep Money. If this show doesn’t sell out, it will be damn close to it–this is a solid lineup with enough brilliance, weirdness and wonder for all. Saturday certainly broadens the options and there’s a hell of a lot going on everywhere, but I’ve chose three fairly fantastic events to highlight here. No matter which of these three you attend, at the end of the evening, you, the listener, win. The legendary Mojo Farmers will celebrate their fourth CD release with their live album Viva Amor at The Sail Inn with an epic lineup that could keep you occupied for over ten hours. 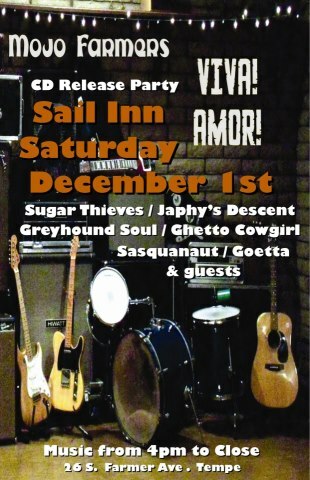 Anyone who has ever been to an event like this at the The Sail Inn knows these shows are amazing, with amazing sound, fantastic bands, great drinks and in the end they make you wish The Sail Inn actually had rooms to rent. The set times for this lineup to drool over are already posted so that you may plan accordingly. 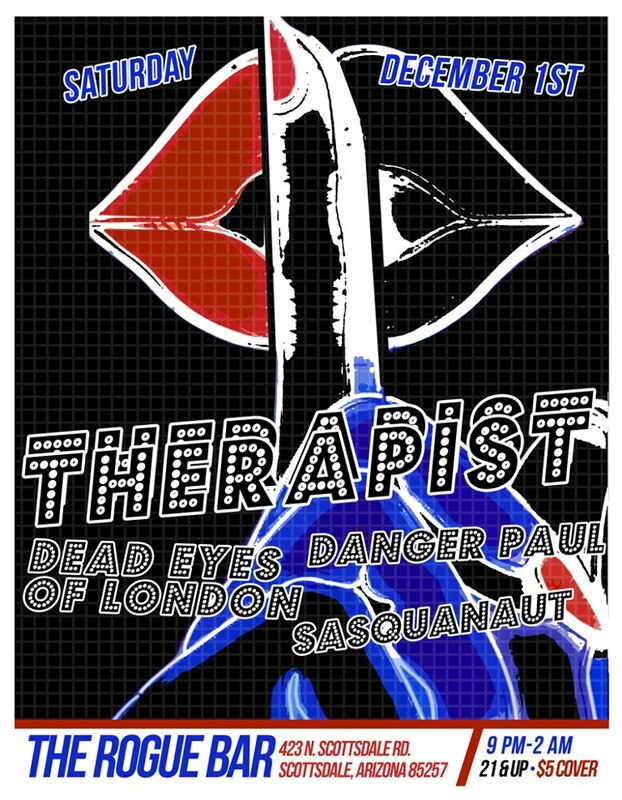 Though I’ve written about Therapist on multiple occasions, I have yet to see them live, needless to say, I’m pretty psyched to see them and The Rogue seems the perfect venue to bust that particular cherry. Yet again another amazing lineup that will have you choosing your time wisely or simply have you stay there all night. With support from Danger Paul, Dead Eyes of London and Sasquanaut this is going to be a stellar show with nothing but an intense high energy vibe from start to finish. Get there early, stay late or arrive somewhere inbetween, you cannot lose. 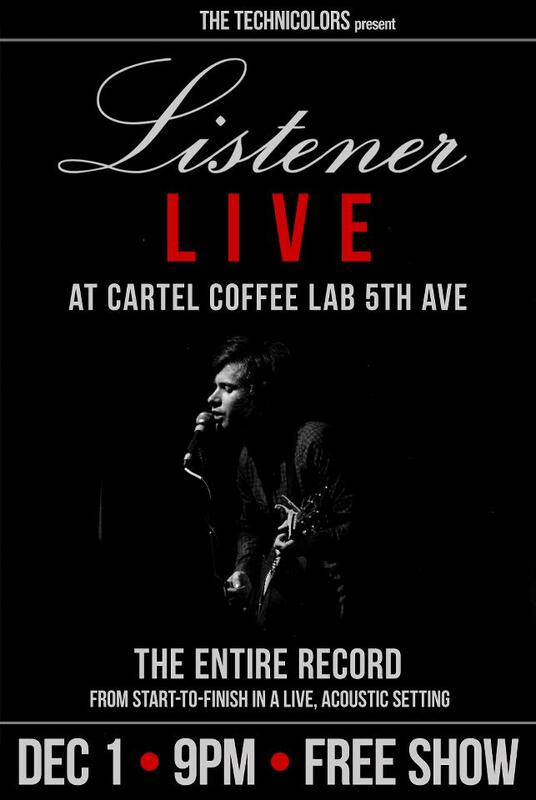 Seemingly out of nowhere, this week, came the announcement that The Technicolors would play a free show at Cartel Coffee Lab. This is exciting enough news concerning the activities of this brilliant burgeoning band, but to up the ante, they will be playing all of Listener from beginning to end…acoustic. If you’ve heard the acoustic versions of “Sweet Time,” “Again,” and “Listener” then you know that this is like listening to their entire album through the looking glass. I have never heard a band that were able to make their acoustic versions sound so uniquely different from their all out electrified rock originals in my life. This will be an amazing and monumental performance. I can only hope the lads have enough sense to record it in some capacity or another.